Tender flavour of pasta nicely compliments the ricotta and aubergine based sauce mixed with garlic and herbs. 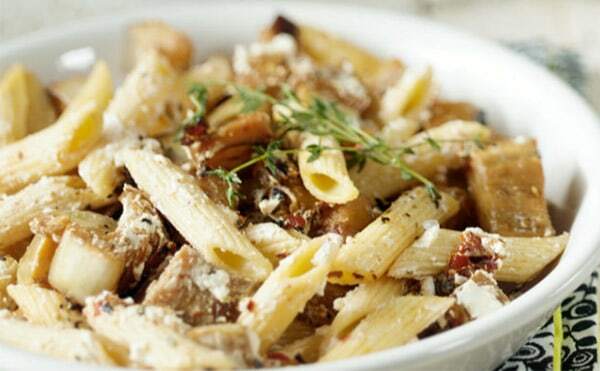 Pasta will provide a generous amount of carbs, while the cheese will add up the proteins you need. This quick recipe is truly amazing. If, for some reason, you’re avoiding pasta, you can easily combine a delicious cheese-aubergine combination with rice, sweet potatoes, or zucchini noodles and get an entirely new flavour you will absolutely adore. Dry fry onion and garlic in a non stick pan, add tomato sauce and oregano and simmer for twenty minutes. Add aubergine, basil and cheese and heat through. Season with black pepper and serve over pasta.